The USS IOWA was the very newest American battleship in the Spanish-American War. Like the INDIANA class, IOWA was classified as a "Seagoing Coastline Battleship", but she was a better sea boat than the earlier battleships. She took part in the Battle of Santiago on July 3, 1898. USS IOWA was assigned to the Atlantic Fleet, and was ordered to blockade duty off Santiago de Cuba on May 28, 1898. She was the first US ship to sight Admiral Cervera's Spanish ships coming out of the channel on July 3, and fired the first shot in the Battle of Santiago de Cuba. In a 20-minute duel with Spanish cruisers MARIA TERESA and OQUENDO, IOWA's effective fire helped set both ships aflame and drive them upon the beach. Later in the engagement, IOWA joined with INDIANA and GLOUCESTER in destroying the Torpedo Boat Destroyers PLUTON and FUROR. IOWA then turned her attention to the Spanish cruiser VIZCAYA which she pursued until the Spanish ship was run aground and surrendered. After the battle, IOWA received on board many Spanish prisoners, including Admiral Cervera and the officers and crews of the VIZCAYA, PLUTON and FUROR. USS IOWA arrived in New York from Cuban waters on August 20, 1898. That October, she departed for the Pacific, sailing around Cape Horn, and arriving in San Francisco on February 7,1899. After a refit at Bremerton, Washington, she conducted training cruises, drills, and target practice. IOWA left the Pacific early in February 1902 to become flagship of the South Atlantic Squadron. She sailed for New York February 12, 1903 where she decommissioned June 30th. She was recommissioned that December, returned to reserve in July, 1907, and again decommissioned in July, 1908. IOWA was recommissioned for training duties from May, 1910 to May, 1914. She was in limited commission for receiving, training and guardship duties beginning April 28, 1917, and was decommissioned for the last time on March 31, 1919. USS IOWA was stricken in 1920, reinstated as IX 6 that same year, and converted to a radio controlled target ship and sunk March 23, 1923. The major advantage of USS IOWA over the ships of the INDIANA class was the new battleship's higher freeboard, which made the guns easier to work in heavy seas. She was not, however, a full-fledged first class battleship equal to those of Great Britain and other powers. 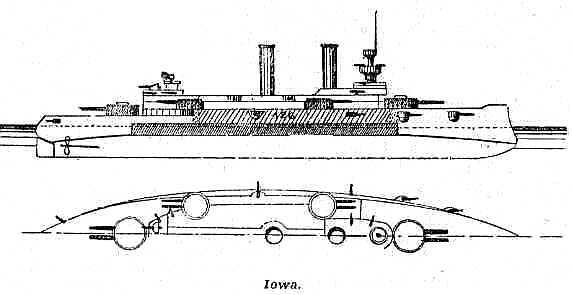 Also, IOWA was of single-screw design and shipped only 12" main guns, both features were a step backwards from the INDIANAs. William Cramp & Sons, Philadelphia, PA.
4-14" belt, 2.75-3" deck, 12.5-15" barbettes, 15-17" turrets. Gardiner, Robert, Ed., "Conway's History of the Ship: Steam, Steel & Shellfire - The Steam Warship 1815-1905", London: Conway Maritime Press Ltd., 1992. We are providing the following service for our readers. If you are interested in books, videos, CD's etc. related to the Spanish American War, simply type in "Spanish American War"(or whatever you are interested in) as the keyword and click on "go" to get a list of titles available through Amazon.com.